This is a quick example of using LINQ to SQL with DayPilot Scheduler. You have a new Web Project open in Visual Studio 2008. You have your SQL Database registered in the Server Explorer (if your DB is a local MDF in App_Data directory it will be visible automatically). 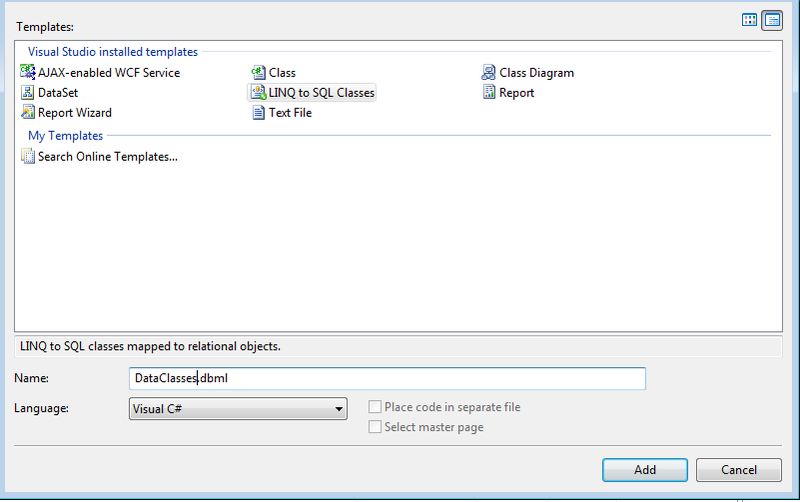 Create a new DBML file called DataClasses.dbml in the App_Code folder using "Add New Item..." context menu action. Drag the tables from the Server Explorer to the DataClasses.dbml window. You can adjust the properties of the entities using the Properties editor. The code will be generated automatically (DataClasses.designer.cs). What follows is a simple code that loads the resources (resource table) and events (event table) to the Scheduler control. The Dps control is added dynamically using a PlaceHolder but it could be added directly to the aspx as well.